Enduring and quiet. The Satellite C50-A-1JU is a basic office laptop based on a Bay Trail Pentium. The laptop for around 400 Euros (~$545) promises long battery runtimes, and good emission rates owing to the energy-efficient quad-core processor. Our test report reveals whether this is achieved in practical use. Quad-core processors have arrived in the budget sector. AMD made the start with its A4-5000 APU. Meanwhile, Intel has caught up, and offers corresponding models based on the Bay Trail platform. They can usually boast with low consumption rates although their performance is located at the lower end. 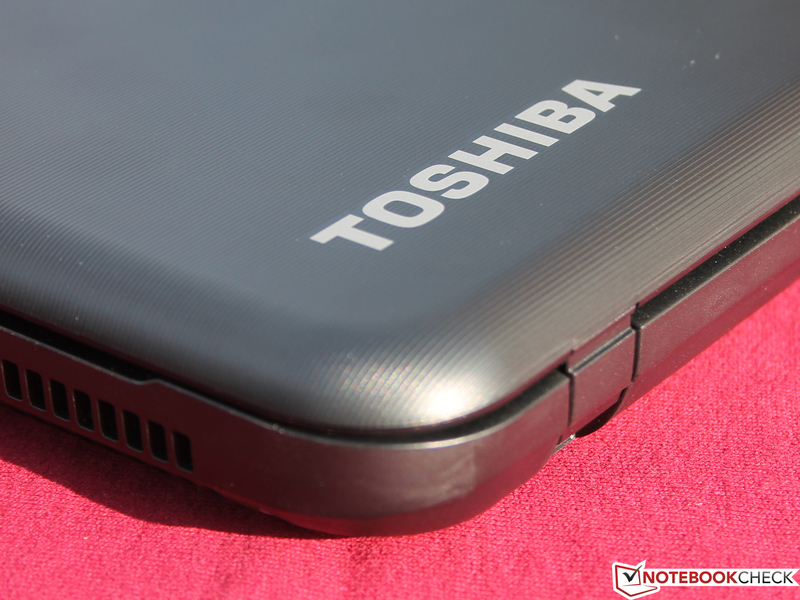 Toshiba now equips a laptop with such a quad-core processor from Intel. The Satellite C50-A-1JU features the same build as the Satellite C50D-A-10E (AMD A4-5000, Radeon HD 8330) that we tested. The latter reaped in "Good" (75%). Our test report uncovers whether the Intel counterpart does a better job. We used the Acer Aspire E1-572 (Core i3 4010U, HD Graphics 4400) and HP Pavilion 15-n050sg (AMD A4-5000, Radeon HD 8330) to classify the laptop. Since the C50 and the C50D are identical in build, we will not deal closer with the casing, connectivity, input devices or speakers. This information can be found in the review of the C50D-A-10E. The Satellite comes with the newest 64-bit Windows 8.1 version by default. A Windows DVD is not included, and thus everyone who buys this laptop should create recovery media. DVDs or a USB flash drive can be used for this. The backup can be created using the pre-loaded Toshiba Recovery Media Creator. Besides Windows 8 or 8.1, it is also possible to use Windows 7. Toshiba provides drivers for all three Windows versions. Note: Only a GPU driver from Nvidia was available on Toshiba's website in the download area of the Satellite at the time of our test. Toshiba apparently mixed something up. It is, however, possible to download the necessary driver from Intel's website. 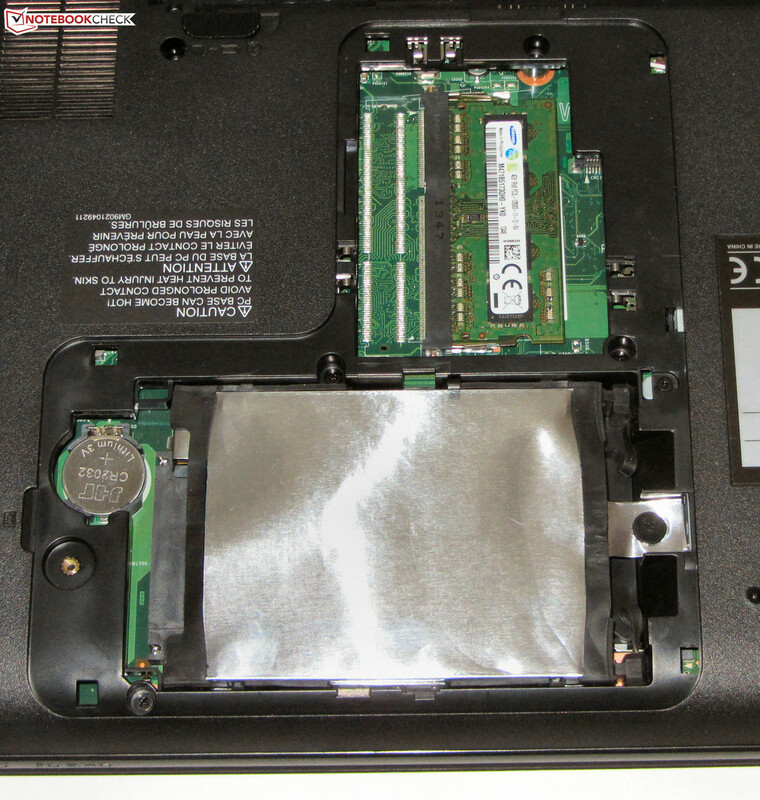 The maintenance cover on the underside enables accessing the working memory, hard drive and BIOS battery. 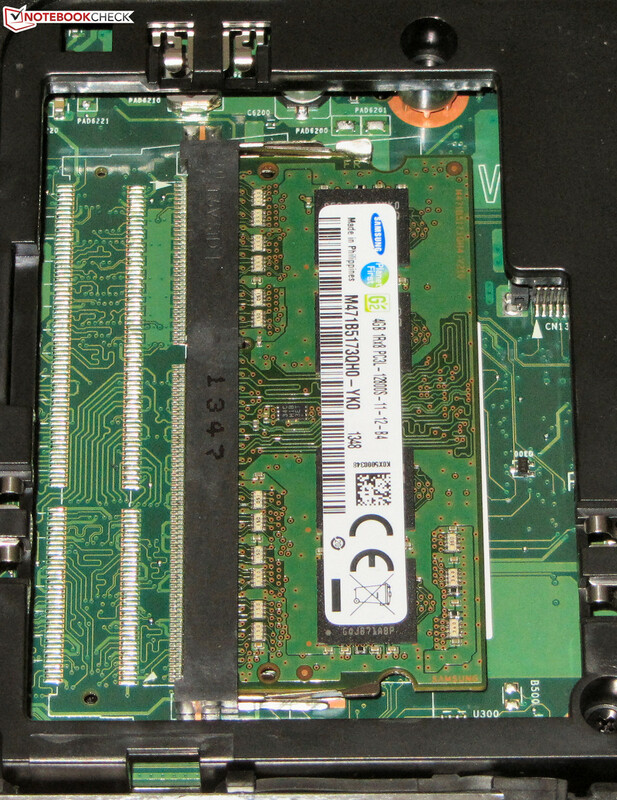 The laptop only sports one working memory bank that is fitted with a 4 GB module. Replacing the hard drive is no problem; 2.5-inch hard drives with a height of 7 or 9.5 mm can be installed. The touchpad in the Satellite C50D-A-10E reaped in a low rating because it did not support multi-touch gestures, among other things. The model came from Alps. In the C50-A-1JU, a model from Synaptics is used that supports the usual gestures, and it consequently achieves a higher rating. The same screen is installed in the Satellite C50-A-1JU as used in the C50D-A-10E. However, its rates are slightly different, which is normal. Two identical screens never correspond to 100%. The Satellite generally offers a contrast-rich screen that can only offer a middling brightness. The Satellite C50-A-1JU is a basic, 15.6-inch office laptop. It is suitable for users who are looking for a laptop for occasional browsing, Skype calls, office tasks or watching videos. The latter naturally includes Full HD videos (1920x1080 pixels, H.264 encoding). The Satellite's GPU features a decoder that unloads the processor during playback. The laptop is currently sold for approximately 400 Euros (~$545). 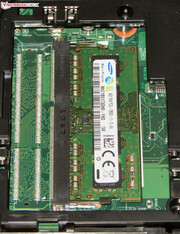 Toshiba offers various other models within the C50 line - based on either Intel or AMD. The Satellite sports a Pentium N3520 processor. This quad-core CPU is based on the Silvermont architecture of the Bay Trail platform. Thus, the processor is related to Intel's Atom processors and not with the CPUs from the Haswell architecture. The Pentium clocks with a base speed of 2167 MHz, which can be boosted to 2420 MHz via Turbo. The processor belongs to the energy-efficient models of its kind. Intel specifies a TDP of 7.5 watts. The CPU processed both the single and multi-thread tests at full Turbo speed (2.4 GHz). 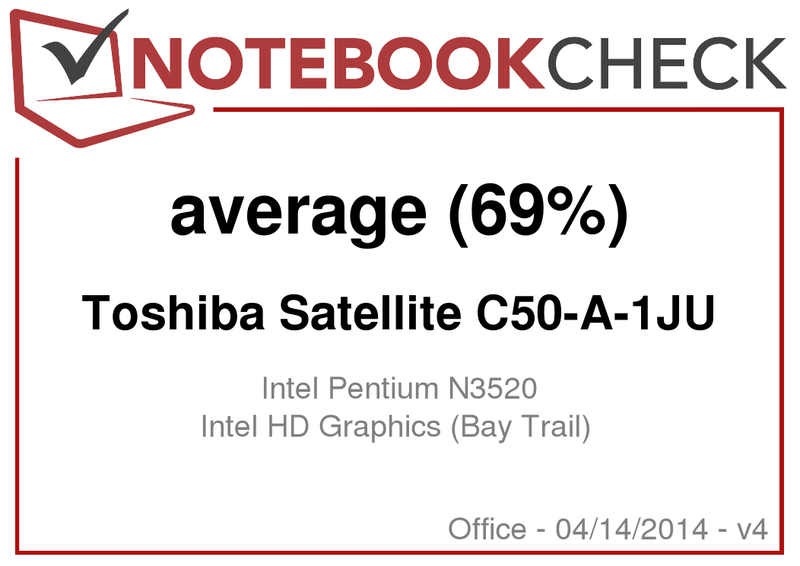 The Satellite generally scores better than the Pavilion (AMD A4-5000, Radeon HD 8330). Intel's processor is stronger than its AMD counterpart. Neither contender can compete with the Haswell Core i3 in the Aspire - at least not in single-thread applications. 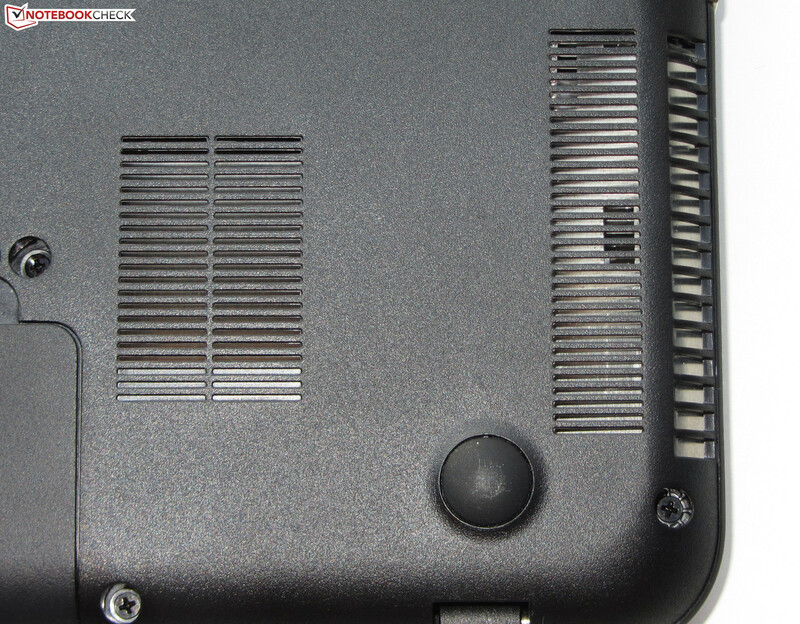 The Satellite closes in on the Aspire (Core i3-4010U, HD Graphics 4400). Nevertheless, the Aspire makes the overall better impression because the single-thread performance is decisive for routine use. 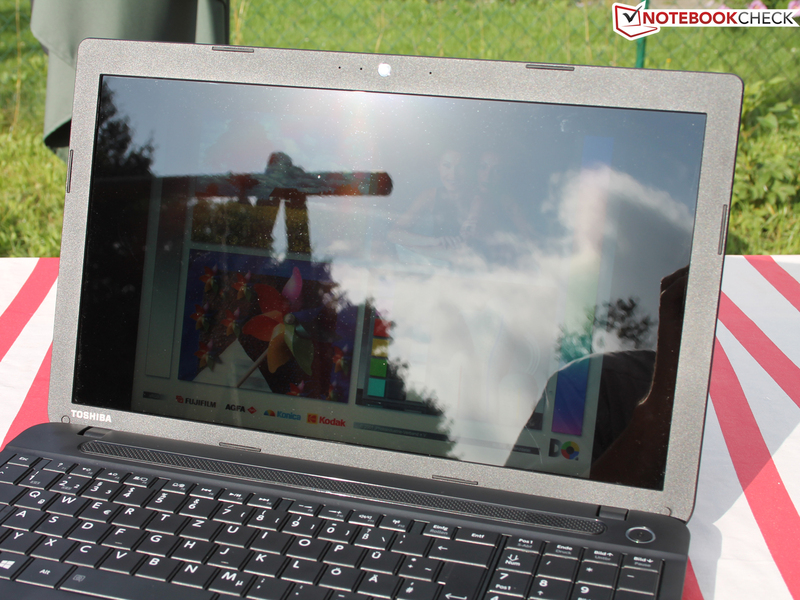 The Aspire also wins the GL tests because it features the strongest graphics core. All in all, the system operates satisfactorily. The relatively weak processor is occasionally noticed. For example, it sometimes needs a moment before a website is opened or the user can switch between two windows. Everything is all right when the processor is not overburdened though. The PCMark benchmarks scores are quite good. The scores of the Pavilion (AMD A4-5000, Radeon HD 8330) only lag marginally behind them. The clear lead of the Aspire (Core i3-4010U, HD Graphics 4400) is no surprise. The system's overall impression can be improved considerably by installing a solid state drive. It has a positive effect on the Windows booting time, and applications. This action leads to better PCMark scores. We tried this using our Crucial RealSSD C300 - 64 GB SSD. The Satellite's PCMark 7 score increased by almost 73% to 2809 points. 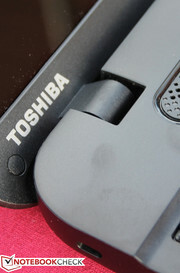 Toshiba installs a hard drive from its own product line in the Satellite. It has a capacity of 500 GB, and spins with 5400 revolutions per minute. CrystalDiskMark recorded a read speed of 108.8 MB/s, and HD Tune delivered an average transfer rate of 89.2 MB/s. Those are good rates for a 5400 rpm hard drive. Already the graphics core's name - HD Graphics - suggests that it is at the lower end of the performance range. It supports DirectX 11, and clocks with a speed ranging from 400 to 820 MHz. The Satellite cannot compete with the Pavilion (AMD A4-5000, Radeon HD 8330) in any of the benchmarks. The Radeon graphics core in the HP laptop is clearly stronger. However, the Pavilion cannot match the scores of the Aspire (Core i3-4010U, HD Graphics 4400) either. The Satellite is not a gamer's laptop. At most, a few games can be played in low resolution and low quality settings. Unlike games conceived for the Windows 8 Metro interface, which should normally not be a problem. Another laptop would be needed for playing up-to-date 3D games regularly. For example, a different Aspire model, the Aspire E1-572G (Core i5-4200U, Radeon HD 8750M). It renders most games smoothly on the screen, and its price is very close to the Satellite's. The laptop is available for approximately 450 Euros (~$613) without a Windows operating system. 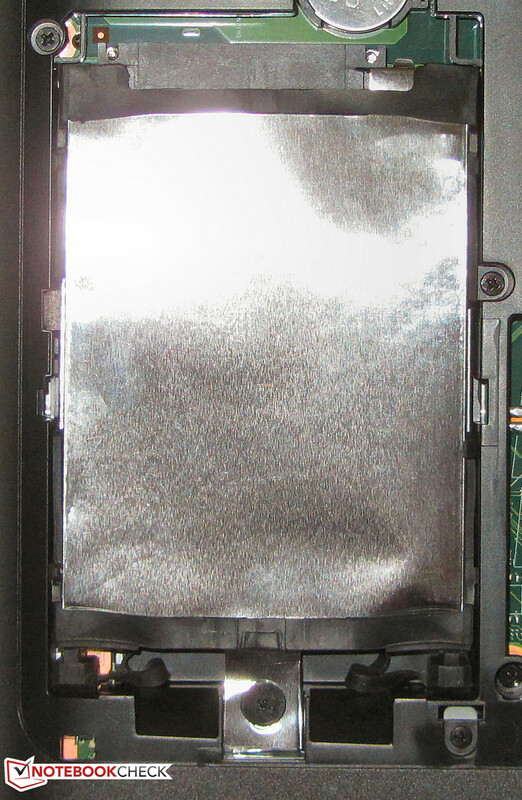 As can be seen through the opening, a large heat sink is used rather than a fan. A fan sound was never heard from the Satellite during our tests. The reason for this is that the CPU's cooling is completely passive, and it thus does not sport a fan. Only the hard drive's base noise was audible. Consequently, the noise level was always 31.5 dB. Users who replace the hard drive with a solid state drive will have a largely silent laptop. Naturally, noises were produced when using the DVD drive, and the noise level increased to 36.2 dB. The Aspire is similarly quiet as the Satellite; the Pavilion is considerably louder - particularly during load. The Satellite C50-A-1JU in the stress test. The exteriors of all three review samples barely warm up in idle mode. The temperatures are all within an acceptable range. This is also true during load. No laptop exceeds 40 °C, or comes close to that at any measuring point. The Satellite's CPU and GPU performed the stress test in both AC and battery mode (Prime95 and Furmark run for at least one hour) in the same way. The CPU clocked at full speed (2.4 GHz) for about 20 minutes. Here, the CPU surpassed 90 °C, and the cores fluctuated between 900 MHz and 2.4 GHz to prevent higher temperatures. It is the opposite with the graphics core. It usually clocked at full speed (820 MHz) in the first 20 minutes, while repeatedly being throttled to 400 MHz. The GPU clocked stably with 820 MHz as soon as the CPU started to throttle. The CPU's temperature settled to approximately 92 °C in the stress test (AC mode). The stress test represents an extreme scenario that is barely achieved in this manner in routine use. Although the CPU's speed fluctuated greatly in the stress test, its full power is available in routine. The benchmarks that we performed prove that. None of the three comparison laptops consume undue amounts of power. The Satellite needs 6.2 to 10.3 watts when idling. It looks the same for the Aspire (5.6 to 9.2 watts), but the Pavilion (5 to 7.3 watts) is more frugal. 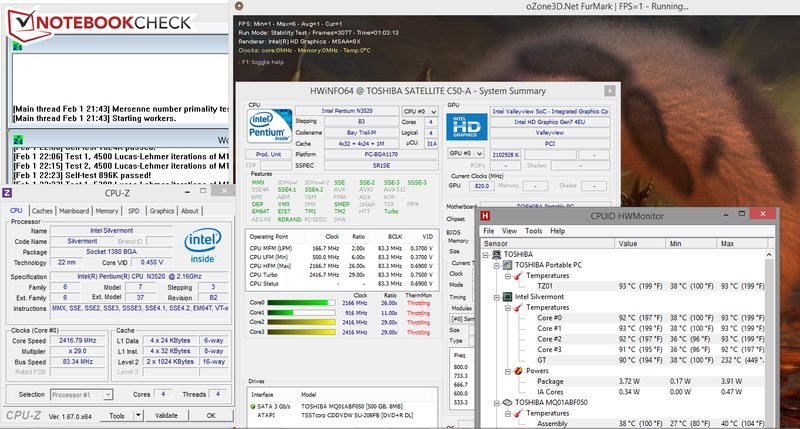 The Satellite has the lead in both medium load via 3DMark06 with 13.1 watts, and 15.1 watts in full load during the stress test using Prime95 and Furmark. Both the Pavilion (17.2 and 21.6 watts) and the Aspire (24.2 and 26 watts) are more guzzling. The Satellite's power consumption would be a bit higher if the processor consistently ran at full speed. The Satellite achieved an idle runtime of 10:15 h. Both the Pavilion (8:39 h) and the Aspire (6:22 h) shut down earlier. 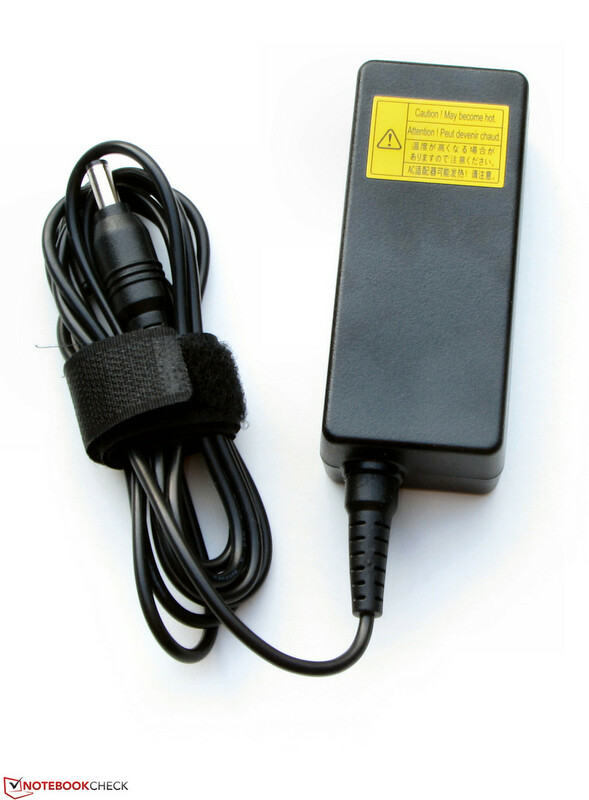 The idle runtime is ascertained via Battery Eater's Reader's test, using the screen's minimum brightness, enabled energy-savings profile, and disabled wireless modules. The Satellite was drained after 3:32 h of load. Again, it lasts longer than the Pavilion (2:25 h) and the Aspire (1:31 h). The load runtime is checked via Battery Eater's Classic test with maximum screen brightness, the high-performance profile, and enabled wireless modules. The Satellite stopped the Wi-Fi test after 5:51 h. The Pavilion (5:25 h) is close behind. We had to perform this test with a LAN cable on the Aspire due to a defect. It reached a runtime of 3:55 h. Websites are opened automatically every 40 seconds for the Wi-Fi test using the enabled energy-saving profile, and a screen brightness of approximately 150 cd/m². The DVD playback runtime of both the Satellite (4:11 h) and the Pavilion (4:09 h) are virtually on par. Again, the Aspire is defeated (2:48 h). The DVD test is performed with enabled energy-savings profile (or higher should the DVD not run smoothly), maximum screen brightness, and disabled wireless modules. As expected, the Satellite provides the best runtimes. It sports the most energy-efficient processor, and the battery with the highest capacity (Toshiba: 48 Wh; Hewlett Packard: 41 Wh, Acer: 37 Wh). 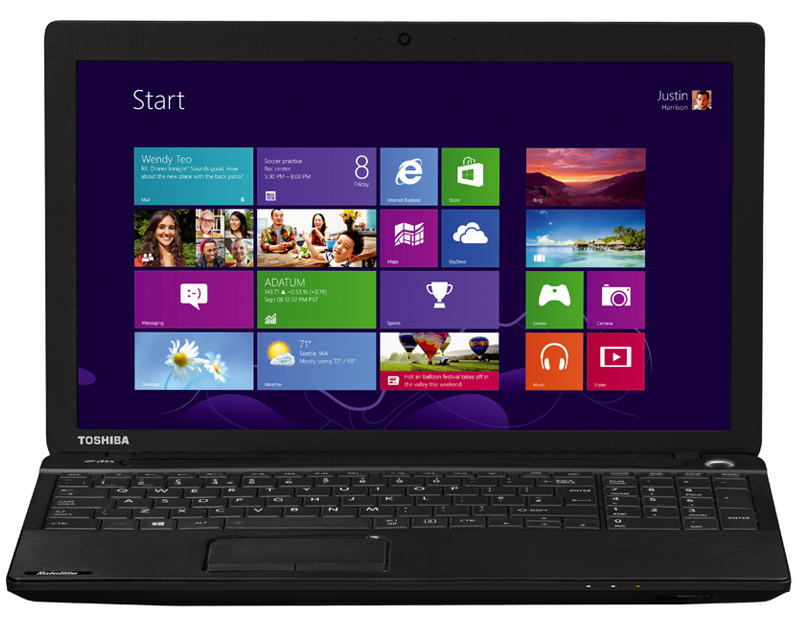 Toshiba's Satellite C50-A-1JU provides enough power to cope with basic tasks. Things like office work, playing videos or even Internet communication can be performed with the laptop. Users who want to do more should take another device. 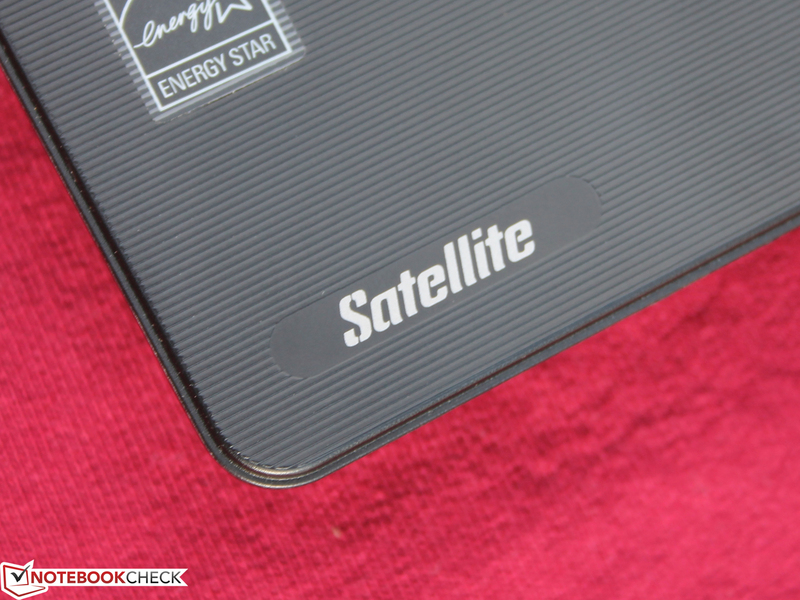 The Satellite's biggest advantages are its very low operating noise, low power requirement, and good battery runtimes. 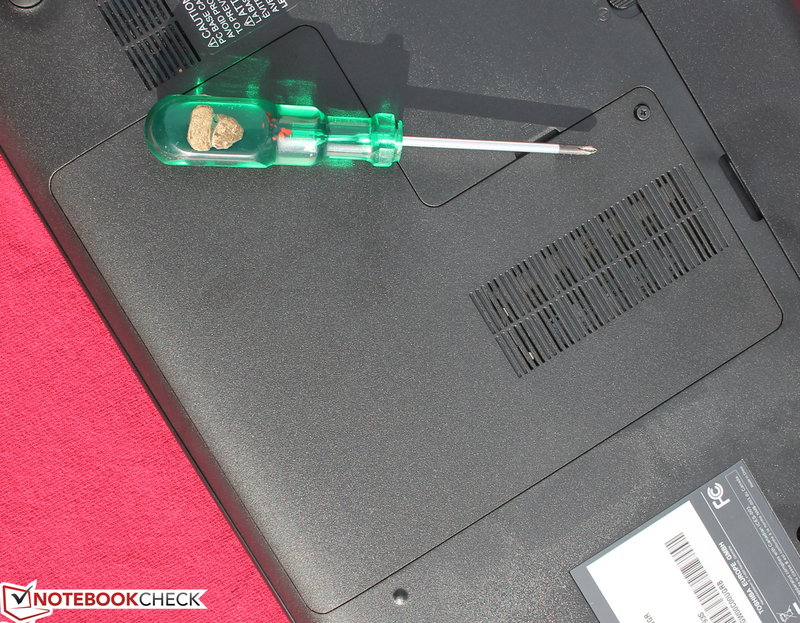 We also like the two-year warranty, which is not a matter-of-course for a low-cost laptop. 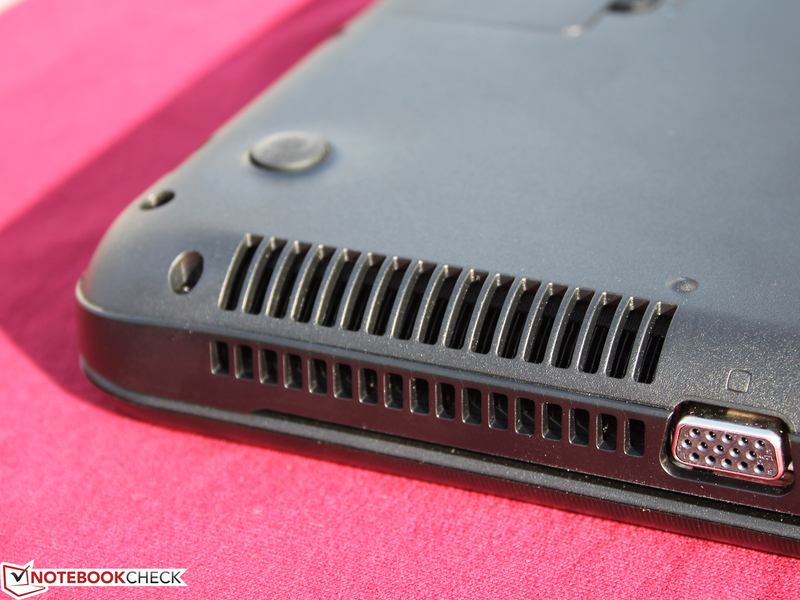 Hewlett Packard's Pavilion 15-n050sg can largely offer similar qualities, but it produces more noise. It also offers a bit less CPU, but a bit more GPU power than the Satellite. The Pavilion is currently sold for approximately 400 Euros (~$545). Acer's Aspire E1-572 is interesting for all users who want as high as possible computing power and/or a matte Full HD screen. The laptop is also sold for just under 400 Euros (~$545), but does not include a Windows operating system. 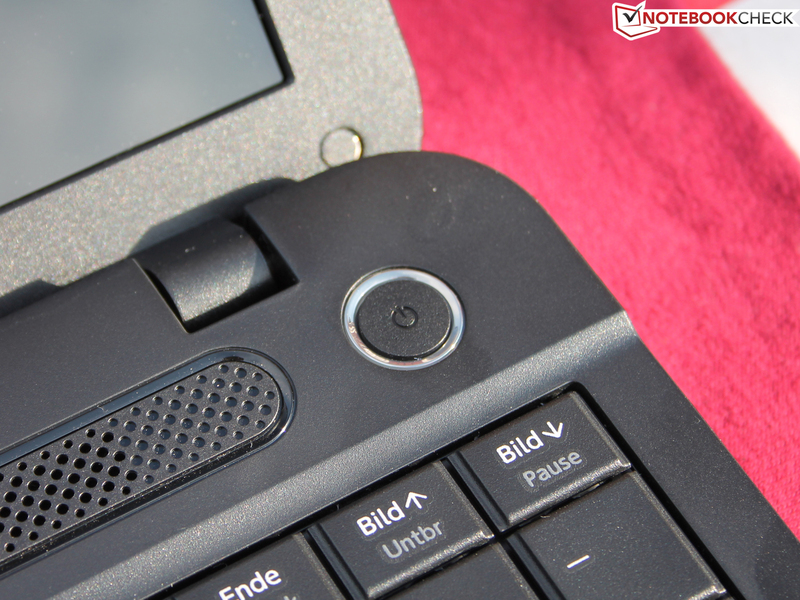 In Review: Toshiba Satellite C50-A-1JU, courtesy of Toshiba Germany. The BIOS battery can also be replaced. The battery weighs roughly 297 grams, and has a capacity of 48 Wh. The power supply weighs approx. 163 grams, and has a power output of 45 watts. The good battery runtimes, the two-year warranty, and the low operating noise. A stiffer casing and a brighter, matte screen. Long battery runtimes in the low-cost sector are not seen every day. 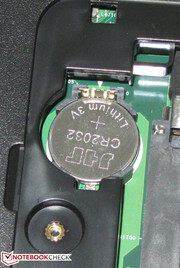 Toshiba can convert the processor's low power requirement into good battery runtimes. Acer Aspire E1-572, HP Pavilion 15-n050sg, Samsung ATIV Book 2 - 270E5E, HP ProBook 455, Lenovo IdeaPad Flex 15, Acer Aspire E1-532, HP Pavilion 15-n005sg, Lenovo G505s, Lenovo G500s, Asus F550CA-XX078D, Acer Aspire E1-522, Toshiba Satellite C50D-A-10E, Wortmann Terra Mobile 1512.